If you’re a fan of the series “Wallace & Gromit,” no doubt you’re familiar with Stinking Bishop, a very strong cheese that dates back to the Cistercian monks, an austere order founded in 1028 and focused on manual labor and field work. A version, based on this order was developed in 1972, to critical aclaim by Gloustershire cheesemaker Charles Martell. It is made from the milk of Gloucster cattle, which in 1972 consisted of only 68 Gloucester breed heifers. The breed has been revived to make production of the cheese possible, though it is often combined and pasteurised with the milk of Fresian cattle from a nearby county. The fat content is 48%. 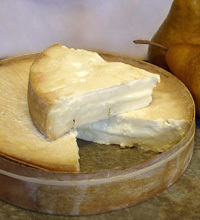 Stinking Bishop is a member of the pasteurized cow’s milk washed-rind family, but the rind here is bathed in perry, an alcoholic pear cider, and develops a stinky, pungent, orange-colored, sticky rind. The cheese itself is not named after a bishop of the Cistercians, but the Stinking Bishop pear varietal. The colour ranges from white/yellow to beige, with an orange to grey rind. It is moulded into wheels 2 kg in weight, 20 cm in diameter, and 4 cm deep. Though only about 340 kg is produced each year, Stinking Bishop's notorious odour, which is said to be similar to unwashed socks and wet towels, keeps it popular in the UK and abroad. The distinctive odour comes from the process with which the cheese is washed during its ripening; it is immersed in Somerset Perry made from the local Stinking Bishop Pear, and from which the cheese gets its name, every four weeks while it matures. As with the French cheese Epoisses, the odour of Stinking Bishop is often found offensive. SERVE STINKING BISHOP WITH: A warm Crusty Bread and dessert wine: Ice wine, Muscat de Beaumes de Venise or a lighter Sauternes. Epoisses (technically, it’s Epoisses de Bourgogne, made in a tiny town in the Burgundy region of France), another washed-rind cheese. Do you see a trend here? You should; many stinky cheeses are of the washed-rind type. This rind is bathed in a local brandy called marc de Bourgogne, then buried in a cellar for four weeks. 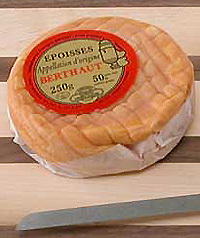 Like Limburger and Stinking Bishop, Epoisses has very big flavors; it also has a particularly strong scent—it is so odoriferous that it is banned on public transportation in France, a country that considers it to be one of its greatest cheeses (and it is!). The red-brown rind is edible; the creamy interior smells like it came straight from the barnyard. SERVE EPOISSES WITH: Our Crusty Rustic bread or Baguette, some Parma ham, dark fruits and a Cheese and Wine Shop Burgundy.